Okay, I'm not supposed to be blogging since I'm in the midst of wrapping up my spring semester (I have a presentation tomorrow and three semester papers to write), but I want to share these Tulip photos with all of you. I've been looking forward to their blooming, and I can't help but fall-in-love with their beauty each year. I hope these beautiful flowers will bring some smile and color to your day - no matter where you are. White Daffodils mixed with Pink Tulips. 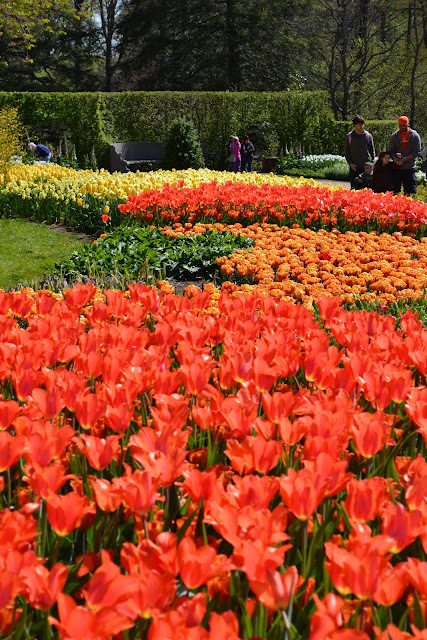 There were rows and rows of all types of Tulips. Our weekend was spent visiting the Tulips of Pennsylvania. I am behind my travel posts, but hopefully, I'll be able to catch up and share my photos with you when I hit summer vacation. Why can't summer come sooner? oh i love it when you feature these beautiful flowers. good luck on your papers and presentation. they look almost too perfect and beautiful to be real. gusto kong mamitas ng mga tulips..ang gaganda..ingat, kayni. Wow. Awesome. Tulips are so lovely! This post definitely brought smile to my face. The tulips are just beautiful!